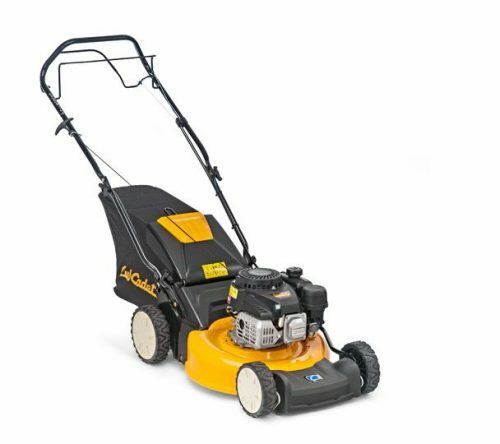 The LM1 AR42 rear-wheel drive, self-propelled lawnmower has a smooth Cub Cadet 35 OHV engine with auto-choke for simple starting. The LM1 AR42 is a great choice for small to medium sized lawns where the self-propelled drive takes the effort out of pushing the lawnmower around the garden. The fully foldable, ergonomic handle provides you with full control of the lawnmower and is ideal for easy transportation and space saving storage when not in use. The single, central cutting height adjustment lever, allows you to easily change the cutting height through six positions from 28mm – 92mm. With a large 60 litre grass bag the amount of time spent emptying is greatly reduced, which means that mowing can be completed sooner. If you prefer not to collect the clippings, the 3-in-1 option means you can purchase an optional mulch kit (196-587-678) as an accessory. 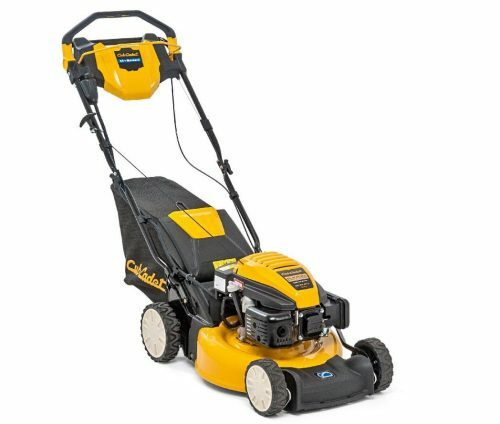 The LM1 CR53 rear-wheel drive, self-propelled lawnmower is powered by Cub Cadet 45 OHV, pull start engine with auto-choke to make starting nice and easy. 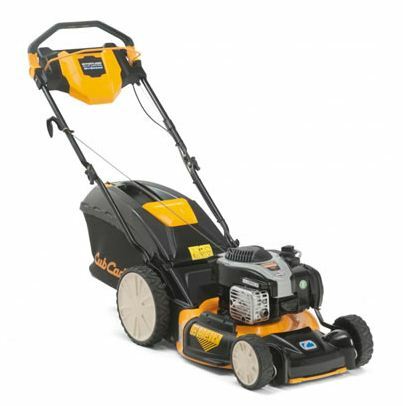 The LM1 CR53 is ideally suited to medium and large sized lawns with a 53cm / 21” cutting deck and can cut up to 950m2/h. The large 70 litre grass bag reduces the amount of time spent emptying it, which means that the mowing can be completed sooner. The cloth bag fits neatly through the mower’s handle to secure in place, and can easily be removed with just one hand. If you prefer not to collect the clippings, the mowers have a 3-in-1 option, providing the choice to discharge the clippings out the back or purchasing an optional mulch kit (196-587-678) as an accessory. 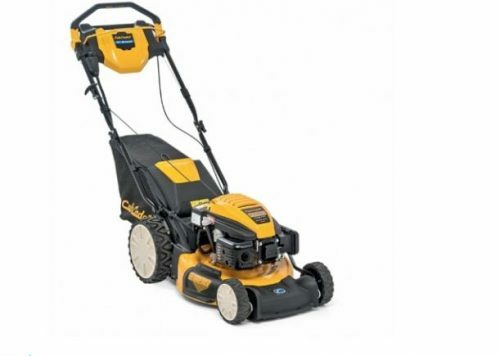 This 46 cm / 18 inch cut petrol lawn mower from Cub Cadet benefits from an intuitive drive system that takes the strain while being wonderfully easy to use. The transmission on this model engages as soon as the handlebar is pushed forwards, before adapting to the speed at which you walk. If you slow down, the machine slows with you, and when you stop, it stops too. This allows you to concentrate on what you are mowing, rather than having to worry about speed. 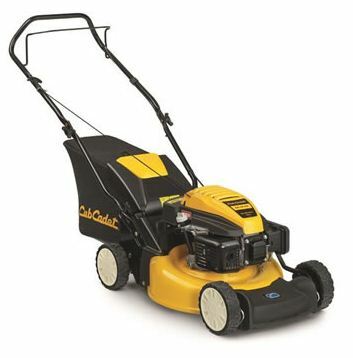 Cub Cadet's LM3 CR46s is a four-in-one machine with a 46 cm / 18 inch cutting width and a 60 litre collector included. As a four-in-one machine, you have the choice between collecting, mulching, rear discharge or side discharge from your machine, giving you the flexibility to keep your lawn at its healthiest, while maintaining a brilliant finish. When mowing certain areas and for long grass you could switch between side and rear discharge to keep the clippings away from particular parts of the garden, while mulching is ideal for a healthy lawn yet still provides a quality appearance. 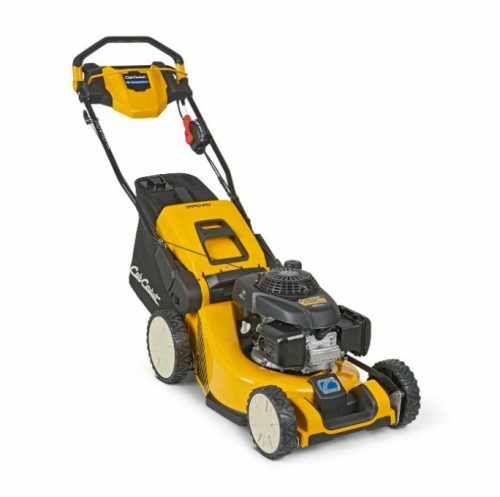 The LM2 DR53s self-propelled lawnmower features a pull start Cub Cadet 55 OHV engine with auto choke and the innovative MySPEED handle. This one-of-a-kind driving system offers effortless and optimum manoeuvrability, allowing you to cut around curved landscaping and hard-to-reach places. The steel deck has a 46cm / 18” cutting width and a 28-92mm cutting height which can be adjusted through 6 stages from one lever. The large, 70 litre cloth bag fits neatly through the mower’s handle to secure in place, and can easily be removed with just one hand. If you prefer not to collect the clippings, the mowers have a 3-in-1 option, providing the choice to discharge the clippings out the back or purchasing an optional mulch kit as an accessory. The LM3 CR53s self-propelled lawnmower features a Briggs and Stratton 150cm³ pull start engine with the innovative MySPEED handle. This one-of-a-kind driving system offers effortless and optimum manoeuvrability, allowing you to cut around curved landscaping and hard-to-reach places. The steel deck has a 53cm / 21” cutting width and a 28-92mm cutting height which can be adjusted through 6 stages from one lever. The large, 60 litre soft bag with hard top fits neatly through the mower’s handle to secure in place, and can easily be removed with just one hand. If you prefer not to collect the clippings, the LM3 CR53s has a 4-in-1 option, providing the choice to discharge the clippings out the back or side, collect or mulch the clippings with the supplied mulch kit. 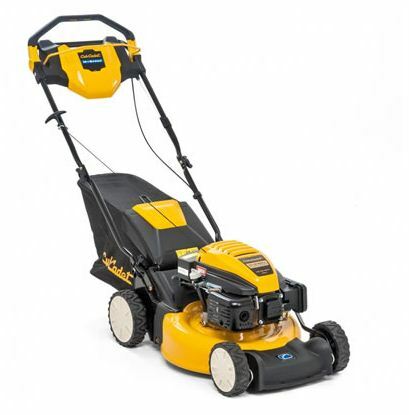 The LM2 DR46es self-propelled lawnmower features a Cub Cadet 55 OHV, 159cm³ with electric start and the innovative MySPEED handle. This one-of-a-kind driving system offers effortless and optimum manoeuvrability, allowing you to cut around curved landscaping and hard-to-reach places. The steel deck has a 46cm / 18” cutting width and a 28-92mm cutting height which can be adjusted through 6 stages from one lever. The large, 60 litre cloth bag fits neatly through the mower’s handle to secure in place, and can easily be removed with just one hand. If you prefer not to collect the clippings, the mowers have a 3-in-1 option, providing the choice to discharge the clippings out the back or purchasing an optional mulch kit as an accessory. 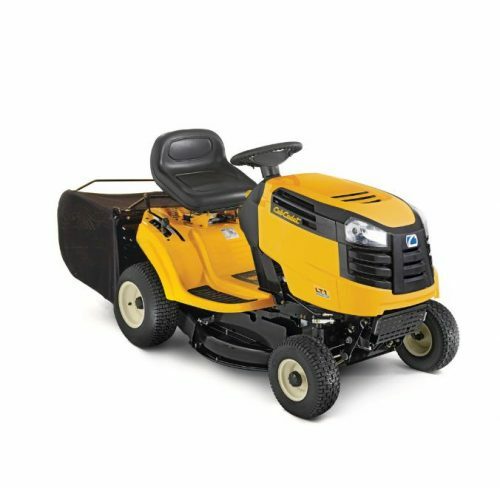 The LM3 DR53es self-propelled lawnmower has a Cub Cadet 55 OHV engine with electric start and features the innovative MySPEED handle system. The rear wheel drive, MySPEED system provides effortless and optimum manoeuvrability, allowing you to cut around curved landscaping and hard-to-reach places. The steel deck has a 53cm / 21” cutting width and a 28-92mm cutting height which can be adjusted through 6 stages from one lever. The large, 60 litre cloth grass bag with plastic hard top fits neatly through the mower’s handle to secure in place, and can easily be removed with just one hand. The LM3 DR53es features a 4-in-1 function, providing the choice to discharge the clippings out of the back or the side, collect them in the large grass bag or mulch with the included mulch kit. 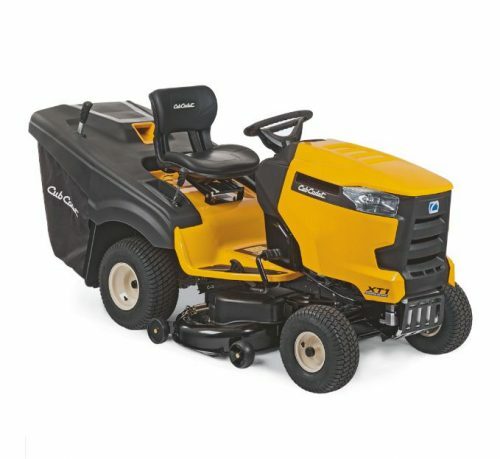 The Cub Cadet XM3 ER53 delivers everything you would expect from a top model: exceptional mowing performance, high efficiency, easy handling and a professional appearance. High performance comes from the powerful Kawasaki engine that gets more output than you‘d expect from every cubic cm of engine displacement. The blade-brake clutch allows the engine to keep running even when the blade is disengaged, so you don‘t have to restart the engine every time. 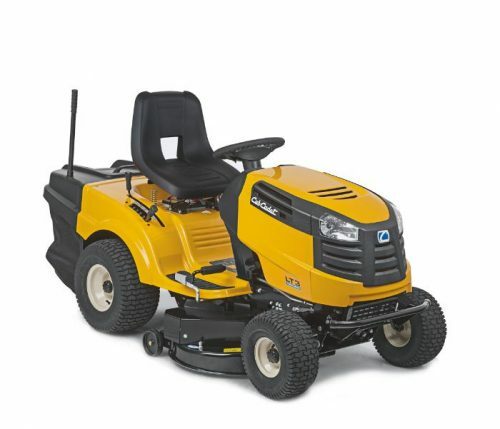 The Cub Cadet LR1 MS76 Mini-Rider is a comfortable ride-on mower with fantastic features like the space-saving design, agility and outstanding performance. 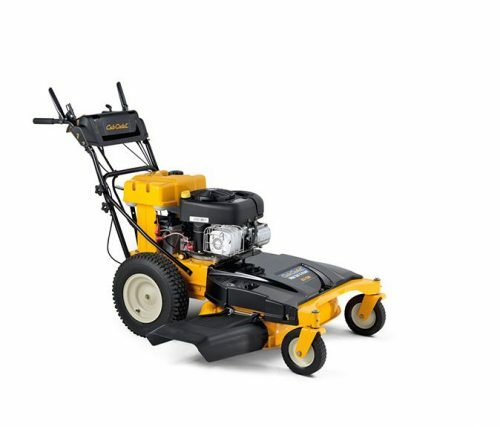 The compact MINI-RIDER LR1 MS76 with electric start is equipped with a powerful 420cc Cub Cadet engine. 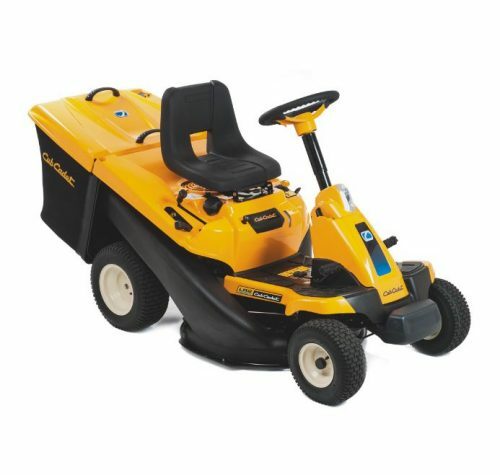 Whether you want the grass clippings to be collected, discharged or mulched, the Cub Cadet LR1 MS76 will do an excellent job. 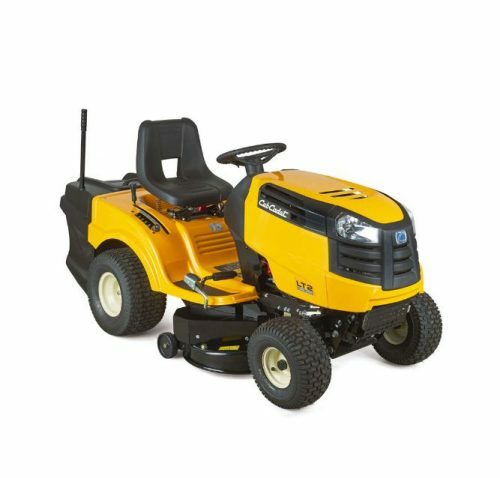 The Cub Cadet LT1 NS96 is a side discharge garden tractor with a 96cm/38", twin bladed cutting deck and 5 cutting height positions ranging from 30mm – 95mm. Featuring a 420cc Cub Cadet engine, six speed transmatic transmission with smooth `change on the move` drive and a tight turning circle of 46cm/18", this tractor is perfect for use in confined areas. Easy and efficient operation is assured with a step through chassis design, allowing very safe, easy mounting and dismounting. Side discharge garden tractors are ideal for gardeners that have a variety of grass conditions to contend with or require a higher work rate than a rear collecting garden tractor. 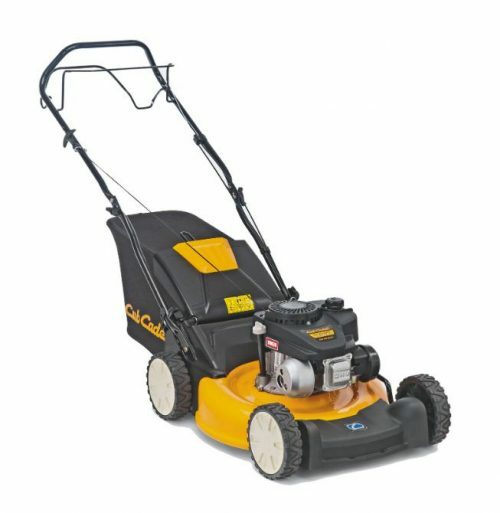 Used as a side discharge it can handle anything up to small paddocks but is also capable of leaving a very tidy finish on a good lawn through the addition of the optional mulch kit and grass catcher accessories. 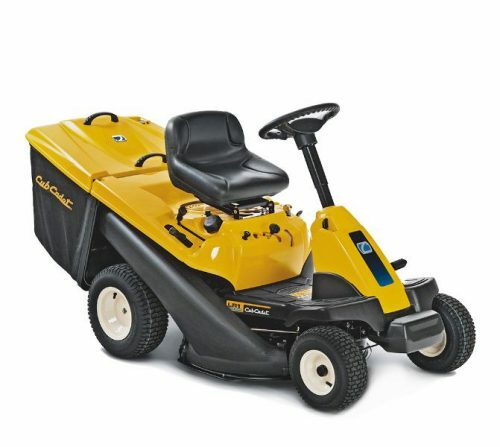 The Cub Cadet MINI-RIDER is a comfortable ride-on mower with fantastic features like the space-saving design, agility and outstanding performance. 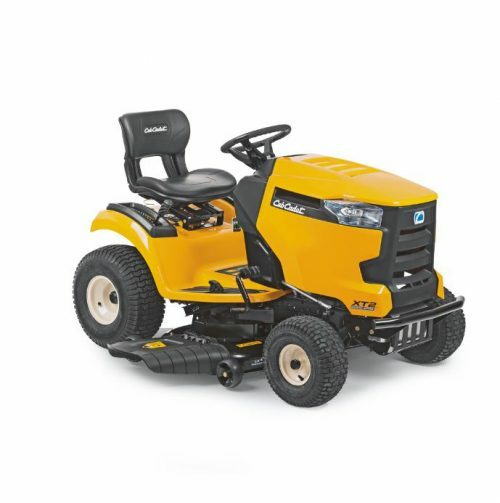 The compact MINI-RIDER LR1 MR76 with electric start is equipped with a powerful 420cc Cub Cadet engine. 3-in-1 functionality means that grass clippings can be collected, discharged or mulched. 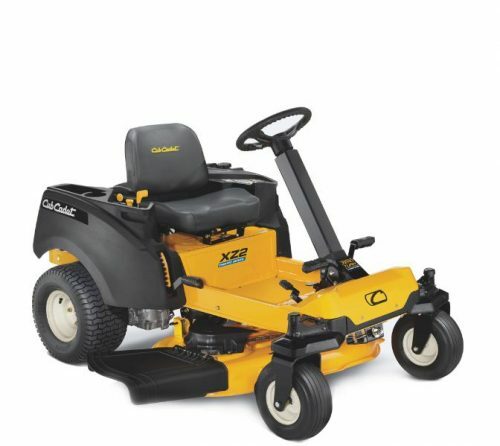 The Cub Cadet LT2 NS96 Garden Tractor is a 96cm/38", twin bladed side discharge tractor, with a 420cc Cub Cadet engine. Easy to use with a step through chassis design, it is incredibly easy and safe when mounting and dismounting. Side discharge garden tractors are ideal for gardeners that have a variety of grass conditions to contend with or require a higher work rate than a collecting garden tractor. 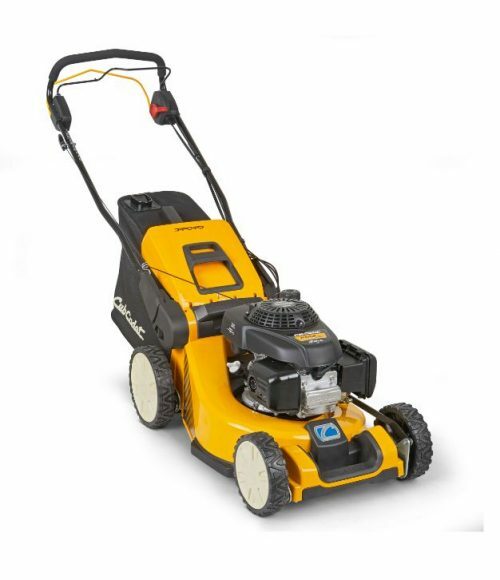 Used as a side discharge it can handle anything up to small paddocks but is also capable (especially when fitted with the mulch plug) of leaving a very tidy finish on a good lawn. The mulch kit is available as standard and an optional grass catcher is available for use with the optional high lift blades for wet grass conditions. 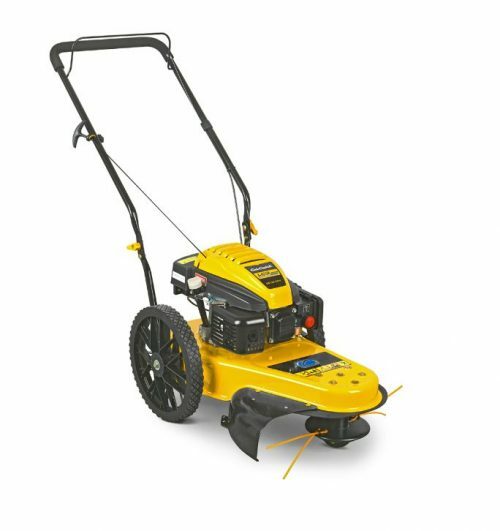 The LR2 FR60 mini-rider has a 60cm / 24" cutting deck width and is powered by a 223cc Briggs & Stratton engine and a hydrostatic transmission drive system. Thanks to the compact design, this Mini-Rider is able to get through typical garden gates with ease and the easy entry step-through frame design and 46cm turning radius, this machine is as easy to use as it is manoeuvrable. 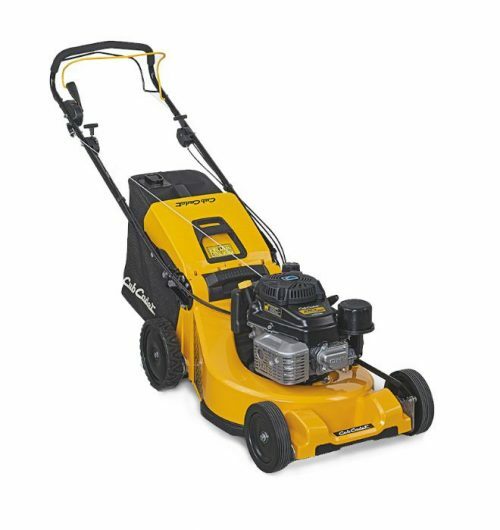 Equipped with 3-in-1 capability, the user has the option of discharging grass clippings from the rear, cutting and collecting them in the 150 litre grass bag, or mulching with the optional mulch plug. The grass bag is easily emptied from the driver's seat and benefits from dual handles and a bag full indicator. 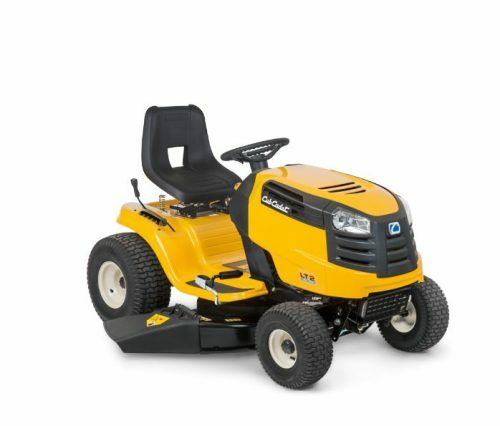 The LT1 NR76 Direct Collect® lawn tractor features a Cub Cadet single cylinder 420cc petrol engine, a 76cm/30” cutting width and a 7-speed Transmatic transmission allowing you to shift-on-the-go. The Direct Collect® system featured on this lawn tractor includes a fan assisted deck, which increases the air flow in the deck, giving the LT1 NR76 class leading grass collection of a single bladed lawn tractor. Another innovation is the integral flip down rear discharge chute that automatically drops into place when the grass box is removed. Worth noting is the tight turning radius of 46cm / 18", which is considerably smaller than most garden tractors this size and the step through chassis design, allowing safe, easy mounting and dismounting. The tractor's grass box is easily emptied from the seat or alternatively lifts off to empty and holds an impressive 200 litres of grass. The LT1 NR76 features RevTEK™ Technology allowing you to cut while in reverse. 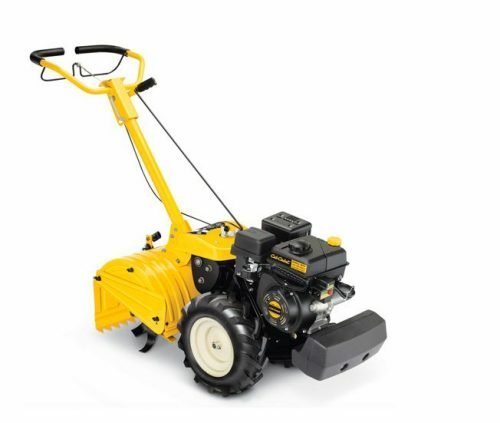 The LR2 NS76 mini-rider has a 76cm / 30" cutting deck width and is powered by a 420cm3 Cub Cadet engine and a hydrostatic transmission drive system. Thanks to the compact design, this Mini-Rider is able to get through typical garden grass with ease and with the easy entry step-through frame design and 46cm turning radius, this machine is as easy to use as it is manoeuvrable. Choose between side discharging the grass clippings or mulching kit (included as standard) or with the addition of the optional 115 L grass collection bag, the clippings can be collected as well. The Cub Cadet LT1 NR92 has a 92cm/36" cutting width and is powered by a 420cc Cub Cadet engine with a six-speed transmatic transmission. The deck is of a twin bladed design, meaning the two blades contra-rotate, working together with the Direct Collect system to drive the grass directly into the grass box giving very good collection even in difficult conditions. With a step-through chassis design, a tight turning radius of 46cm/18", a 240 litre grass box which can be easily emptied from the seat, this garden tractor is as easy to use as it is manoeuvrable. It is ideally suited for areas between one and one and a half acres of lawn. The XM3 KR84es Wide Cut Lawnmower with electric start is perfect for green-fingered gardeners with a large and lavish lawn. It is especially useful where large areas of grass need cutting, but access by a lawn tractor is difficult. 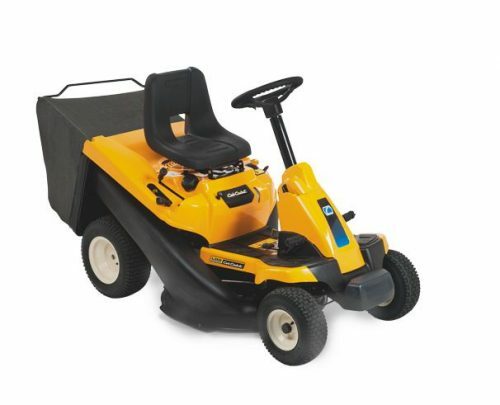 This extra wide cut rotary lawnmower has a Briggs & Stratton engine and an 84cm / 33" side eject mulching deck. 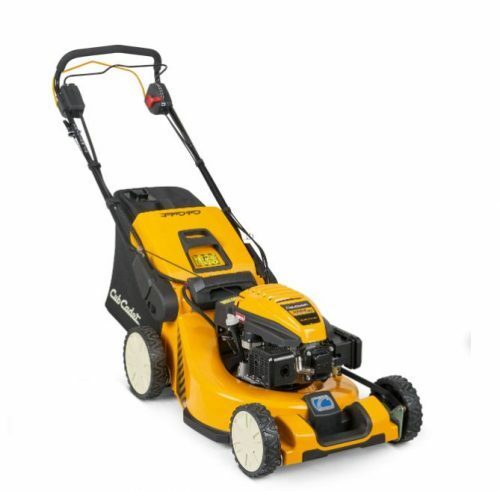 The wide cut lawnmower has a blade engagement lever and pneumatic rear tyres for easy rolling with extra manoeuvrability provided by zero turn capability.The 4 speed transmission and single speed reverse can significantly cut down your mowing time with the ability to cut up to 2,000 m2/h. 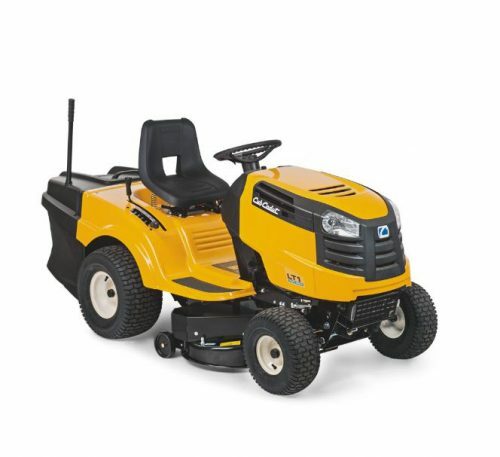 The LT2 NR92 Garden Tractor is a 92cm / 36" cut tractor, with a 420cc Cub Cadet engine. This tractor features a hydrostatic gearbox allowing both the speed control and the forward and reverse all to be operated from one foot pedal. The deck is of a twin bladed design, meaning the two blades contra-rotate, working together as part of the direct collect system to drive the grass directly into the grass box ensuring excellent collection, even in difficult conditions. The grass box is easily emptied from the seat and holds an impressive 240 litres of grass. This garden tractor is ideal for areas between one and two acres. 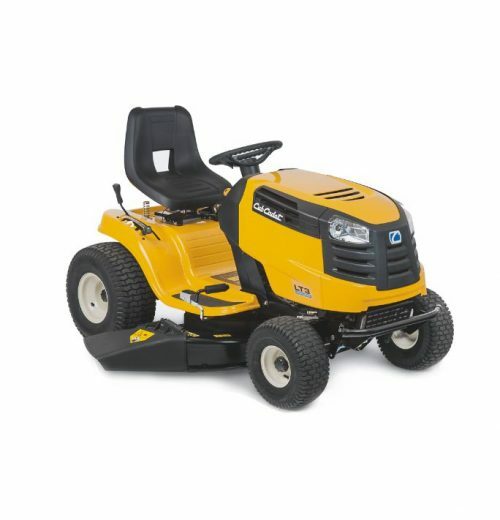 The Cub Cadet LT3 PS107 Garden Tractor is a large 107cm/42", twin bladed side discharge tractor, with a powerful 656cc V-Twin Briggs and Stratton Intek engine. 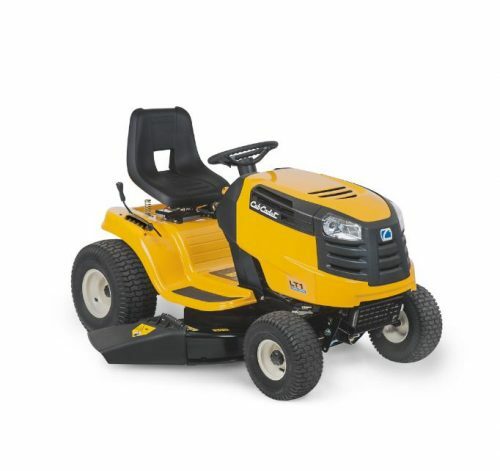 With a large cutting deck side discharge, this garden tractor is ideal for gardeners that have a variety of grass conditions to contend with or require a higher work rate than a collecting garden tractor. 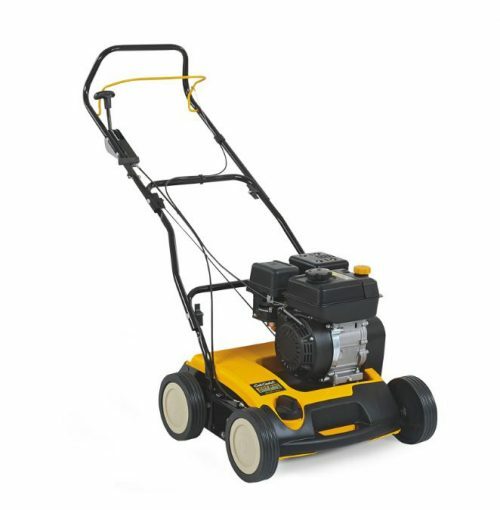 Used as a side discharge it can handle anything up to small paddocks but is also capable (especially when fitted with the mulch plug) of leaving a very tidy finish on a good lawn. The mulch kit is available as standard and an optional grass catcher is available for use with the optional high lift blades for wet grass conditions. 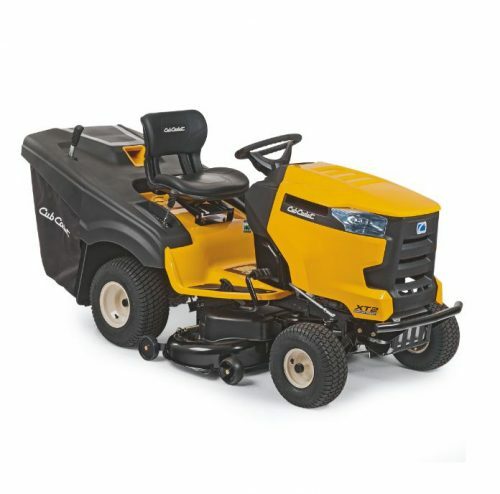 The Cub Cadet XT1 OS107 side discharge ride on garden tractor has a 107cm / 42” cutting width delivering a perfect cut and enabling this to be done in the quickest time. Easy to use and quick to adjust, setting the height from one of the 12 deck height settings is done with the simple movement of a lever and with a wide height range of 25mm – 100mm to choose from, the enjoyment can begin. The XT1 OS107 also features built-in soft touch cruise control, making mowing large areas an easy and relaxing activity. XT1 lawn tractors are ideally equipped for side discharge mowing, or mulching using the easy fit mulching plug provided with the machine. Grass collection is available as an optional accessory (19A30003100) along with a special range of accessories. The LT3PR105 features a 105cm/41” cutting deck able to be set through 5 deck height positions and cut from 30mm to 95mm. This 3-in-1 garden tractor is able to mow 4,000 m²/h per hour and comes equipped a 240 Litre grass bag. Featuring the Cub Cadet Direct Collect system, where grass clippings are driven directly into the grass box giving superior collection, even in difficult conditions. Mulching requires an optional mulching kit. 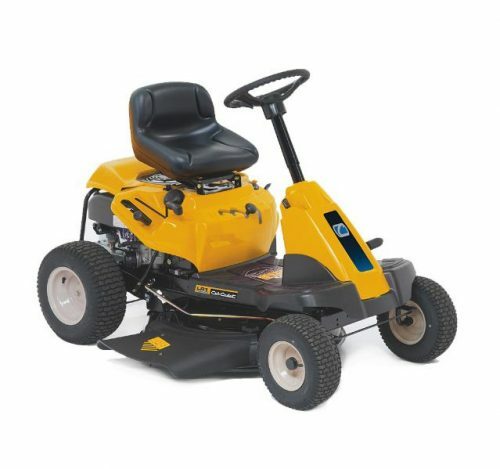 The grass box is easily emptied from the seat and the hydrostatic drive system is powered by a Briggs and Stratton Intek V-Twin ensures a smooth and comfortable ride. The solid, stable and durable frame features an e-coating corrosion defence system providing the ultimate stability and protection. The cutting blades are activated with the simple pull of a button and the height of the cut can be adjusted through a wide range of 25mm to 100mm. The hydrostatic drive system ensures a smooth ride and is very simple to operate, just push the pedal and go. With a market leading cut, collect and optional mulch system delivering exceptional cutting results, in the minimum amount of time. The XT1 OR95 features a unique anti-clog system, designed to transport the grass clippings into the grass bag in the most efficient and effective way. Optional rear grass deflector is also available for use when collection is not required. 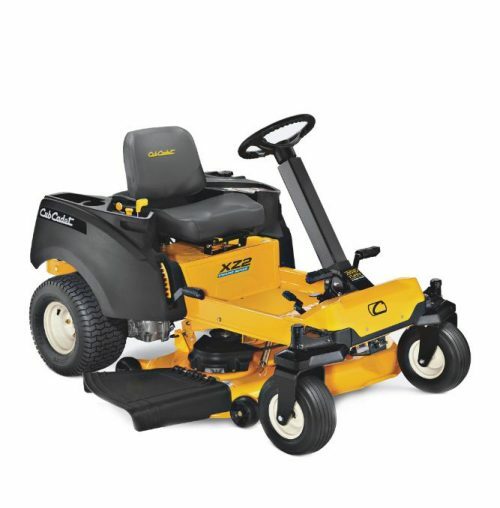 The Cub Cadet XT1 OR106 is a 106cm / 42” rear discharge direct collect garden tractor with a single cylinder 547cm3 Cub Cadet engine. This reliable and powerful engine has 12.9kW of power and is perfectly matched with smooth hydrostatic gearbox providing a flawless drive. The cutting blades are activated with the simple push of a button and can be adjusted through a wide cutting height range from 25mm to 100mm. With a market leading cut, collect and mulch system delivering exceptional cutting results from this large deck, you can get the job done in the minimum amount of time and hassle. 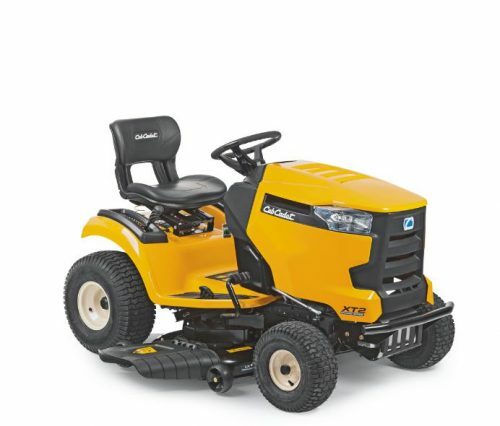 The Cub Cadet XT2 PS107 has a powerful Kawasaki V-Twin engine and a hydrostatic drive system delivering a smooth and comfortable ride. This side discharge lawn tractor has a 107cm / 42” cutting deck width able to cut up to 2,000 m2 per hour from 25mm -100mm through 12 deck height positions. 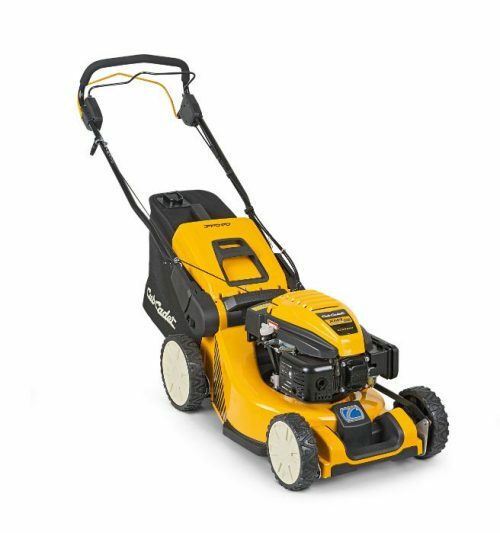 Also featured on the XT2 PS107 is the Cub Cadet Tight Turn xTreme, the tightest turning circle on the market with a turning radius of just 17cm, providing unsurpassed manoeuvrability in tight places and around garden obstacles. The RevTek system enables mowing in reverse and it comes complete with a mulching kit and grass deflector. A grass collection bag is available as an optional accessory (19A30003100), with other accessories to further enhance its use and capabilities also available. Get updates about status & inspection dates on your smartphone through the Cub Connect Bluetooth® App and charge your phone with the multifunction socket. Smooth, responsive zero-turn handling delivers incredible precision and efficiency. A reinforced steel frame and chassis with a heavy-duty fabricated front axle, the XZ1 107 is above all else, strong. Combined with its ball-bearing hubs, you can tackle the toughest of terrain without feeling it. That's high performance and durability working together in a perfect union. A wide operator station, dual-adjustment lap bars and a high-back Cub Comfort™ seat make for the most spacious, comfortable zero-turn experience. An advanced cutting system design with optimal airflow, blade overlap and floating deck deliver flawless cutting and bagging performance, cut after cut. 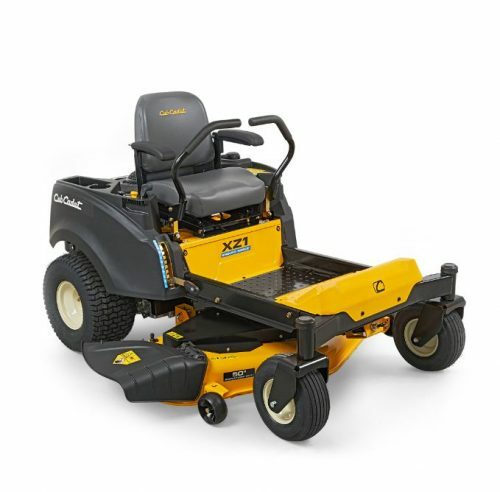 The Cub Cadet XT2 PS117 features a 117 cm / 46” cutting deck width with 12 deck height positions and a cutting height range from 25mm to 100mm. This side discharge lawn tractor is perfect for larger lawns and small paddocks with the ability to cut up to 2,000 m2 per hour and with a sizeable 11.4 Litre fuel tank, you can get the job done quickly with efficiently. The XT2 PS117 features the Cub Cadet Tight Turn xTreme, the tightest turning circle on the market with a turning radius of just 17cm, providing unsurpassed manoeuverability in tight places and around obstacles. The RevTek system enables mowing in reverse and it comes complete with a mulching kit and grass deflector. A grass collection bag is available as an optional accessory (19A30003100), with other accessories to further enhance its use and capabilities also available. Get updates about status & inspection dates on your smartphone through the Cub Connect Bluetooth® App and charge your phone with the multifunction socket. The Cub Cadet XT2 PR95 is a versatile and extremely agile rear collection lawn tractor with the tightest turning circle on the market. 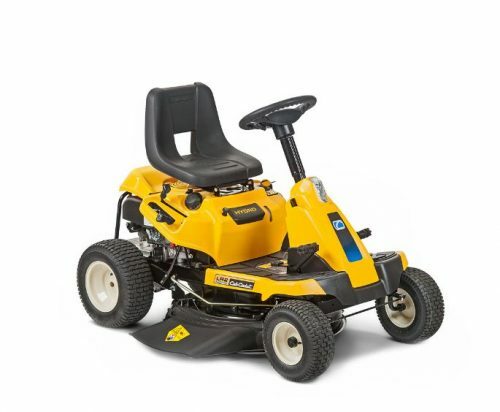 The Cub Cadet lawn tractors with Tight Turn xTreme have a turning radius of just 17cm, delivering unsurpassed manoeuvrability and capability in tight places. A robotically-welded steel frame with e-coating corrosion defence system ensures longevity and with a heavy-duty cast-iron front axle, the XT2 PR95 is built to last. The powerful and reliable V-Twin Kawasaki engine features a push button start and the hydrostatic drive system operated by foot pedal control provides a smooth and comfortable ride. The 95cm / 38” cutting deck width enables up to 1,500 m2 to be cut per hour and grass clippings can be emptied easily from the operator seat using the telescopic handle on the large 320 litre grass bag. Get updates about status & inspection dates on your smartphone through the Cub Connect Bluetooth® App and charge your phone with the multifunction socket. 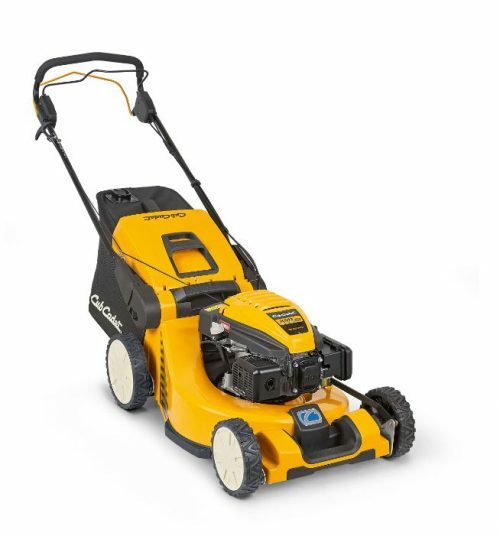 The Cub Cadet XT2 PS117 features a 117 cm / 46” cutting deck width with 12 deck height positions and a cutting height range from 25mm to 100mm. This side discharge lawn tractor is perfect for larger lawns and small paddocks with the ability to cut up to 2,000 m2 per hour and with a sizeable 11.4 Litre fuel tank, you can get the job done quickly with efficiently. The XT2 PS117 features the Cub Cadet Tight Turn xTreme, the tightest turning circle on the market with a turning radius of just 17cm, providing unsurpassed manoeuverability in tight places and around obstacles. 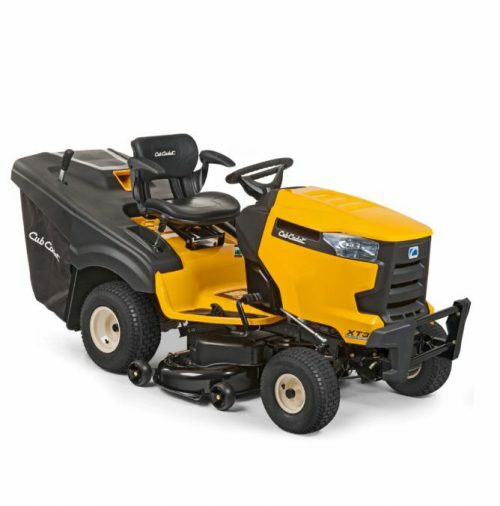 The powerful and reliable Cub Cadet EFI engine gives you reliable performance and power with significant fuel efficiency. 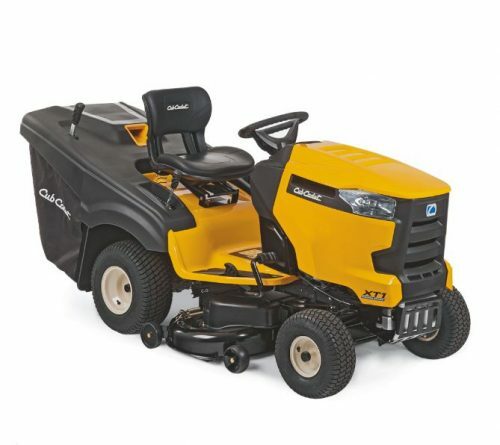 Setting new standards in comfort and strength the Cub Cadet EFI engine uses up to 25% less fuel versus standard carburetted engines.The RevTek system enables mowing in reverse and it comes complete with a mulching kit and grass deflector. A grass collection bag is available as an optional accessory (19A30003100), with other accessories to further enhance its use and capabilities also available. Get updates about status & inspection dates on your smartphone through the Cub Connect Bluetooth® App and charge your phone with the multifunction socket. 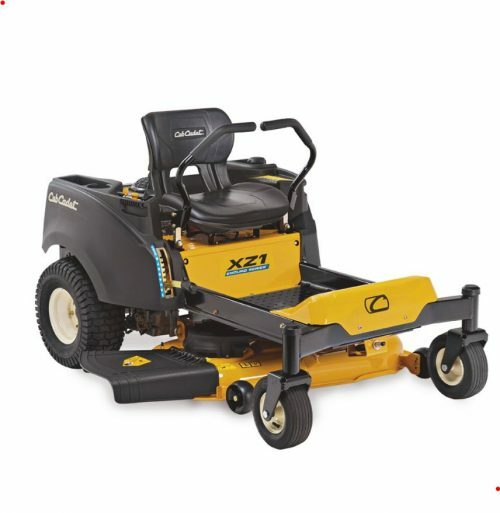 The XT2 QR106 features the Cub Cadet Tight Turn xTreme, where a turning radius of 17cm provides unsurpassed manoeuvrability in tight places and around the garden. The powerful and reliable V-Twin Kawasaki engine features a push button start and the hydrostatic drive system operated by foot pedal control provides a smooth and comfortable ride. It also features a 106cm / 42” cutting deck able to cut up to 2,000 m2 per hour. The integrated bag full system identifies when the large 320 litre grass bag is full and the blade shut off system lets you know it is full. The grass bag has a built in telescopic lever meaning that emptying it when full can be done without even getting out of the seat, whilst the RevTek system enables mowing in reverse.Get updates about status & inspection dates on your smartphone through the Cub Connect Bluetooth® App and charge your phone with the multifunction socket. 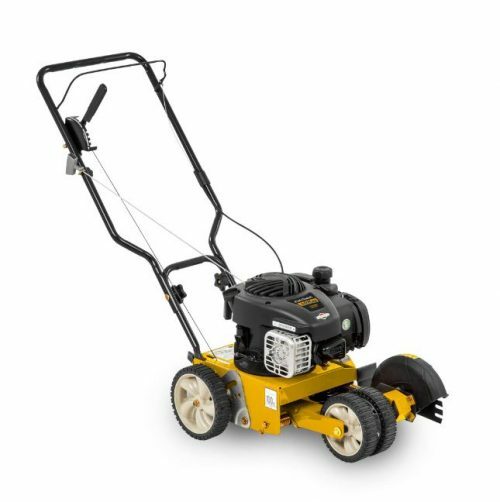 The XT2 PR106ie features the Cub Cadet Tight Turn xTreme, where a turning radius of 17cm provides unsurpassed manoeuverability in tight places and around the garden. 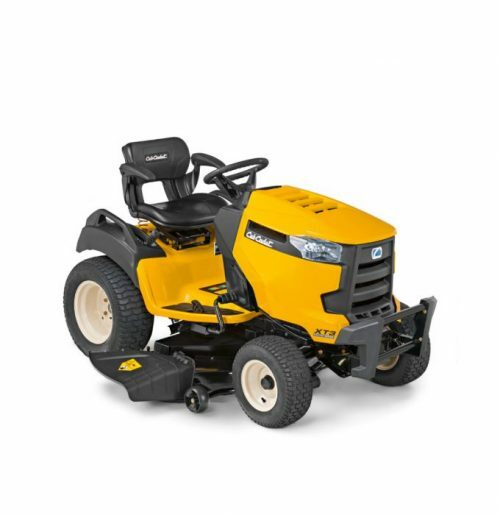 The powerful and reliable Cub Cadet EFI engine gives you reliable performance and power with significant fuel efficiency. Setting new standards in comfort and strength the Cub Cadet EFI engine uses up to 25% less fuel versus standard carburetted engines. It also features a 106cm / 42” cutting deck able to cut up to 8,000 m2 per hour. The XT2 PR106ie features a 106cm / 42" cutting deck, able to cut up to 8,000 m2 per hour. The integrated bag full system identifies when the large 320 litre bag is at capacity and the electronic bag lift means that emptying it couldn’t be easier. The innovative machine even has a Bluetooth® app, called Cub Connect, which keeps track of inspections and servicing. The optional anti-dust system protects against swirling grass and dust. The XT3 QR95 rear collection lawn tractor has a 726cm3 Kawasaki V-Twin engine with the torque, power and performance needed to tackle all your landscape challenges. The All Ground Traction mechanical differential lock system provides the optimum traction across various terrains and landscapes and with a narrow turning radius of 38cm, you can be sure whatever the terrain, the XT3 QR95 has it covered. The large 360 litre grass bag has an auto shut of system when the grass bag is full and it can be easily emptied without even having to leave the seat thanks to the telescopic handle. Also featured is a zip on anti-dust system which prevents swirling grass and dust in dry conditions. All XT3 lawn tractors come with Cub Connect, a Bluetooth® App keeping you informed with status updates and inspection dates via your smartphone and the 12v on board multifunction socket enables you to charge your phone, even whilst mowing the lawn. Optional mulch kit and rear deflector along with a range of additional accessories are also available. The XZ1 127 is powered by a beefy 22hp Kawasaki V-Twin overhead valve engine. The twin-cylinder engine is more efficient and smoother than single-cylinder engines. The engine has a full-pressure lubrication system for longer life. Zero-Turn means that on full lock there is no uncut grass. The dual hydrostatic transmission is fully automatic ensuring one foot pedal does everything. 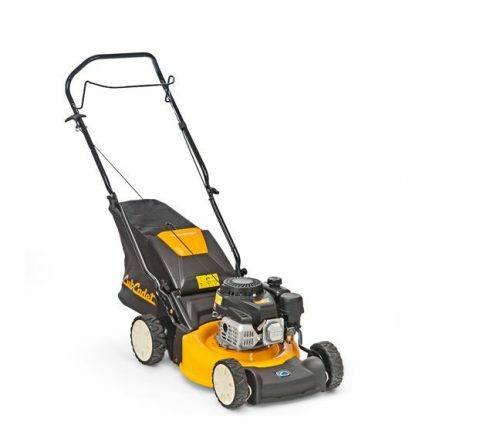 The 127cm/50" mowing deck contains three belt-driven cutting blades to mow 25 percent more lawn per cut than a 40" lawnmower and ideal larger lawns up to 3 acres in size. Combined with a forward speed of 6 mph (3 mph in reverse) and this ride on mower can reduce mowing time dramatically over many other types of mowers. The two adjustable levers provide maximum control from the quickly adjustable seat. There are four adjustable-gauge wheels at the deck corners to minimise scalping the lawn. Cut grass is discharged through the side and there is an optional twin grass bag available to collect grass via a side chute. The XZ2 117i delivers true Zero-Turn manoeuvrability, with steering wheel control over all four wheels providing unmatched stability on steep and diverse terrain - and anywhere else you want to cut. The new Cub Cadet EFI engine uses up to 25% less fuel versus standard carbureted engines. It has no carburetor and requires fewer oil changes. Therefore decreasing the time and money spent on maintenance. The Cub Cadet EFI engine's improved governing system provides more usable power when harsh mowing conditions demand it. The dedicated dual hydrostatic rear-wheel transmission delivers effortless Zero-Turn control, synchronised with the steering through patented Syncro-Steer® technology to help reduce turf damage. The advanced cutting system with optimal airflow, blade overlap and floating deck delivers a consistent, flawless, high-quality cut and an enviable lawn. 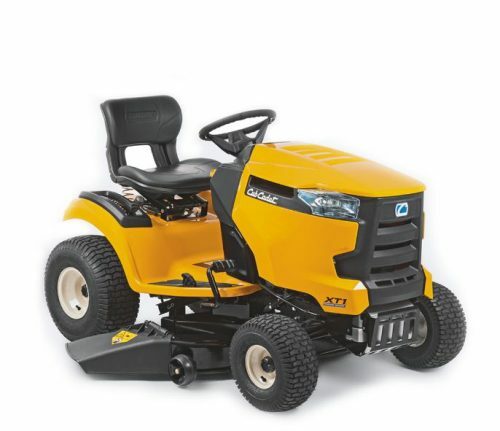 The XT3 QS127 lawn tractor features a 127 cm / 50” cutting deck width with 12 deck height positions, electric PTO deck engagement and a cutting height range from 25mm to 100mm. This side discharge lawn tractor is perfect for larger lawns and small paddocks with the ability to cut up to 3,500 m2 per hour. The 726cm3 Kawasaki V-Twin engine is coupled with a smooth hydrostatic gearbox delivering power, performance and a smooth ride. A robotically-welded steel frame with e-coating corrosion defence system ensures longevity and a heavy-duty cast-iron front axle and mechanical differential lock on the All Ground Traction system ensures the optimum traction on tough and sloping terrain. Also featured is the RevTek system enabling mowing in reverse and it comes complete with a mulching kit and grass deflector. Grass collection system and other accessories to further enhance its use and capabilities are also available. All XT3 lawn tractors come with Cub Connect, a Bluetooth® App keeping you informed with status updates and inspection dates via your smartphone and the 12v on board multi-function socket enables you to charge your phone, even whilst mowing the lawn.